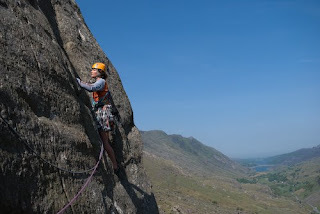 I have to admit that there was no way I could have gotten away with describing Dinas Mot as one of the best crags in the world, However it is a classic venue for rock climbing, although probably not this time of year, as it rarely gets the sun during the summer let alone the winter. However I took a crag shot the other day, and threw together this topo. 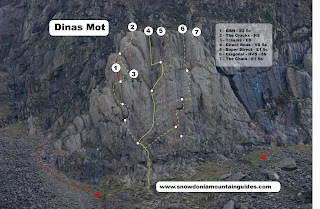 Basically Dinas Mot is a great place to venture after a beginner has cut there teeth at multipitch venues like the Idwal Slabs, Milestone Buttress, Tremadog and the Meolwyns. What the Mot offers is a selection of classic HS to E1 routes that are great for breaking that grade barrier and then continuing on. In particular the first route many people do on the crag is The Cracks, a classic HS where the sting in the tail prepares you for the general theme of the crag. After that then there are few VS’s as good and as clean as Direct Route, a Colin Kirkus classic, with one of the most photogenic pitches in the pass. 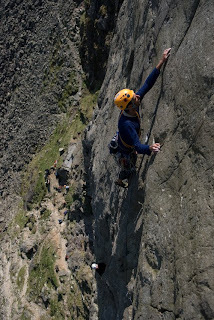 However the crux pitch is like all on this crag the last, where the slab becomes a steep or even overhanging wall. Similar in style and feel are both diagonal and Super Direct, although its recommended that you finish up the Chain as the finale of Diagonal. Whilst the last pitch of Super Direct is one where you’ll need to attack with a rugged determination. A South African Climber gets to grips with Diagonal during the BMC International Meet. If the final crack of Super Direct isn’t enough for you then come back round and try the single pitch of GBH, a savage off-hands to hands crack, that despite barely being 30ft in height packs a mean punch.